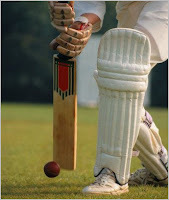 A striking similarity exists between our workplace and the game of cricket (Test Match)! We just have to look at it that way. Lets presume that our side is the batting side and the opponent will field. The Marketing & Sales department (popularly known as the Business Development department) starts the batting order. The entire game depends on how well the openers perform i.e. right from lead generation till deal closure. Huge orders with high profit booking would mean a century stand between the openers. Once the openers are out, the middle order comes into action i.e. the Operations (or the delivery crew) department comes into play. It all depends how they carry the momentum provided by the openers. Any goof-up in the middle order would mean "flop show"! Their innings get over with the successful project execution and client acceptance. Now the tail-enders play with the remaining show... billing, collection, collation... etc...! I guess.. this is heights of imagination... i.e. imagining our CEO in place of MSD (India Captain) conducting team huddles in the market... ha ha ha! I am sure you readers would agree to me...! Very nice conceptual thought.....But don't you think you have involved your thoughts like you go everyday??!! Yes... its an as is picturisation of what I go through everyday!! like you said -'look at it that way' - similarities and differences are a matter of perspective... The IPL i guess has a even more similar mark of an organisation - with the owner pitching in as the chairman, with profits, selections and lay offs, competition, image building etc.